Fort Cummings was established 1in 1839 near the shore of Lake Alfred in Polk County, Florida as part of a line of forts to protect the Fort Mellon-Fort Brooke Trail. Erected during the Second Seminole War, the fort was named for Colonel Alexander Cummings of the Fourth Infantry. It was established January 22, 1839, and occupied by detachments of the First and Second Infantry and the Third Artillery. In 1841, the fort witnessed an interesting event when Seminole Chief Wildcat appeared at the fort attired in the full regalia of a member of a Shakespearean cast. The year before, in 1840, Wildcat and his band attacked a theatrical group between Picolata and St. Augustine and after killing the men of the party escaped with the costumes belonging to the troupe. These, he and his band wore as they approached the fort. The Fort was abandoned in the mid-1840’s. 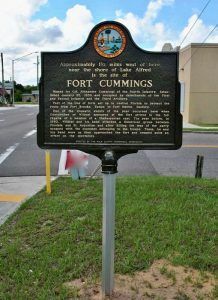 There are no remains of the fort today, but the site is designated by a historic marker located at the intersection of South Lake Shore Way (U.S. 17/92) and West Pierce Street in present-day Lake Alfred, Florida.